Just like Christmas traditions, Easter and Holy Week customs throughout Europe vary from country to country and even region to region. Most customs include religious rituals and church services, candy, feasting and family gatherings. Easter festivities usually begin filling the streets, squares, and shops during Holy Week, the seven days before Easter Sunday, and it’s a colorful time to visit the Old World. 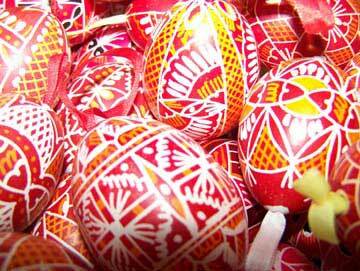 In some central and eastern European countries, Easter is a greater holiday than Christmas. The Prague Easter market in the Old Town Square showcases over 100 stalls of handcrafts, toys, Czech crystal, regional delicacies and beer, and beautiful hand-painted eggs. Folk dancers and residents in traditional costume provide a lively atmosphere. For the children there are workshops for painting eggs and other activities. In Romania, after the late evening church services on Holy Saturday, visitors can observe local peoples parading through the streets carrying lighted candles in a solemn procession. 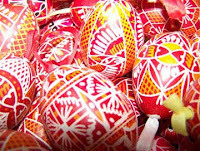 In some villages, intricately decorated eggs are hung from tree branches, strung onto wires, featured in games, and taken to church to be blessed. Unusual European customs include egg fights in Bulgaria, where whoever comes out of the game with an unbroken egg is the winner and assumed to be the most successful member of the family in the coming year, and the Hungarian tradition of Wet Monday, when boys throw buckets of cold water over girls to make them healthy for the rest of the year. Also, not to be missed, are the Holy Week festival in Braga, Portugal, and the Semana Santa processions in southern Spain, most famously in Seville. The cities are crowded with tourists for the ancient traditions of floats in elaborate processions depicting the passion of Christ. And, of course, the apogee of all Easter experiences would be in Vatican City. Blessings, processions, vigils, and Masses in many languages are frequent throughout Holy Week. A schedule of events is available on-line. Be sure to check for closures of possible Vatican museum closures this week on-line here. Lastly, residents of every country enjoy food prepared for the Easter celebration. Lamb, sweet breads, cakes, and eggs are traditional dishes for many. In England, hot-cross buns are popular on Good Friday. These are sweet fruit buns with crosses on top. In Western Europe, the pretzel is eaten, and legend has it that the twists resemble the crossed arms of a person in prayer. Oooh, thank you for reminding me of wet Monday! My husband is Canadian, but of Polish heritage. Every year I forget about Smygus Dyngus, and every year I get water tipped on me unexpectedly. Not going to happen this year, I'm prepared! 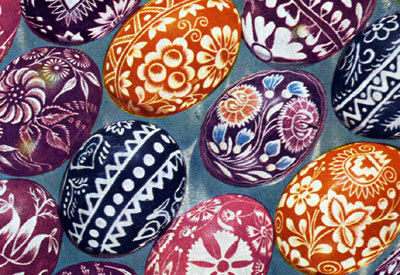 I love the Eastern European eggs... they are so intricate and beautiful!